(CNN) -- Slovakia became the first of the larger ex-communist EU members to join the European single currency on Thursday amid hope the move will provide stability in the global economic storm. The country is the 16th country to use the euro after 11 EU members launched it 10 years ago, meaning that from New Year's Day 2009, 328 million of the 500 million people in the European Union will share the single currency. After Sony postponed a planned investment in a TV production plant in Slovakia earlier this month, other firms in the country welcomed entry into the eurozone as a move that will end uncertainty after years of coping with a volatile currency. "First of all, the euro means price stability, both in relations with our clients in the euro zone and our business relations with suppliers localized in the euro zone countries," Jean Mouro, CEO of PSA Peugeot Citroen in Slovakia told Reuters.com. "In general, it will reduce costs related to swift changes of the euro-crown exchange rate, especially in the last few years when the crown had been appreciating rapidly," said Mouro. Businesses also said that amid global economic uncertainty the euro will also result in lower production costs, as weakening economic activity limits inflation. "We evaluate Slovakia's transition to the common European currency solely as a positive factor," said Katarina Holecova, a spokeswoman for a Samsung factory in Slovakia. "In relation to the financial crisis, euro adoption may bring a positive impact in terms of softer inflation pressures, and thus, indirectly, savings in material or wage costs." In the past two months, the euro has soared in value against the dollar by 9 percent and against the British pound by more than 20 percent. 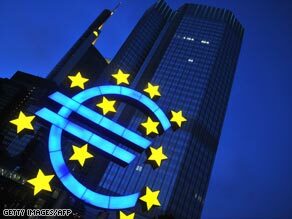 Joaquin Almunia, European Commissioner for Economic and Monetary Affairs on Wednesday hailed the currency's strength. "The euro has become the symbol of EU identity and is protecting us against the tremendous external shocks that we have had to cope with since the summer of 2007," he said in a statement. "We should be proud of that record and we safeguard the sound budgetary and macroeconomic framework that has made the euro such a success."